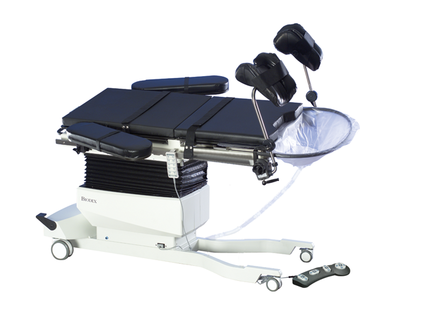 The Urology C-Arm Table is an ideal choice for image-guided procedures. The narrow Fiberesin™ tabletop is cantilevered to accommodate portable or ceiling suspended C-Arms. Radiolucent areas are free of cross members, allowing full fluoroscopic visualization and unobstructed C-Arm positioning. 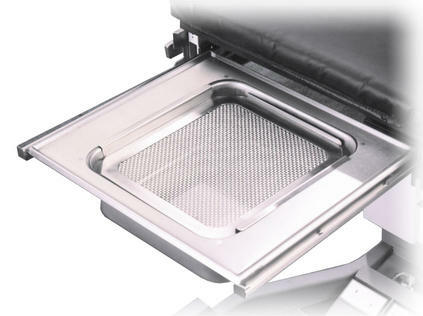 Optional Cassette Tray and X-ray Grid allow for the use of overhead or portable x-ray. Functional design provides complete access while minimizing radiation exposure to clinicians. 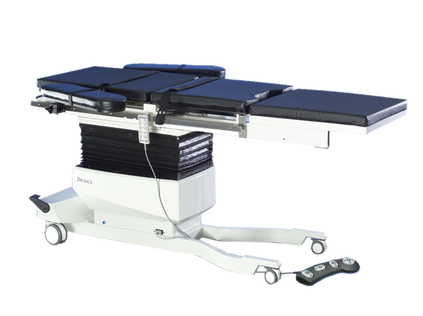 The Urology C-Arm Table features motorized actuation of height, X-Y, lateral roll and Trendelenburg motions of the tabletop. The hand-held and foot-operated controllers can be positioned for access from any point around the table and ensure quick and safe tabletop positioning during any phase of a procedure. The "Level" feature returns the table to 0° tilt and 0° lateral roll, bringing the table quickly to a level position. Both controllers can be used for motorized X-Y positioning of the tabletop and feature proportional speed control. The table back positioning adjusts with a simple touch-handle lock/unlock mechanism to an 80° angle with incremental stops at 20°, 30°, 40°, 50°, 60°, 70° and 80°. The table comes equipped with a lightweight, non-imaging patient transfer extension and a radiolucent extension. The radiolucent extension provides capability for vascular, cardiac and other general C-Arm applications. Select from knee crutches or the PAL stirrups, arm boards or drain systems, the choice is yours... configure to your exact specifications. Both AC and battery power are standard. When operating on battery, there are no power cords to hinder movement or block casters. Battery charging can be accomplished during off hours by plugging in the AC adapter cord. An optional battery, with separate charging unit, provides continuous cordless operation.